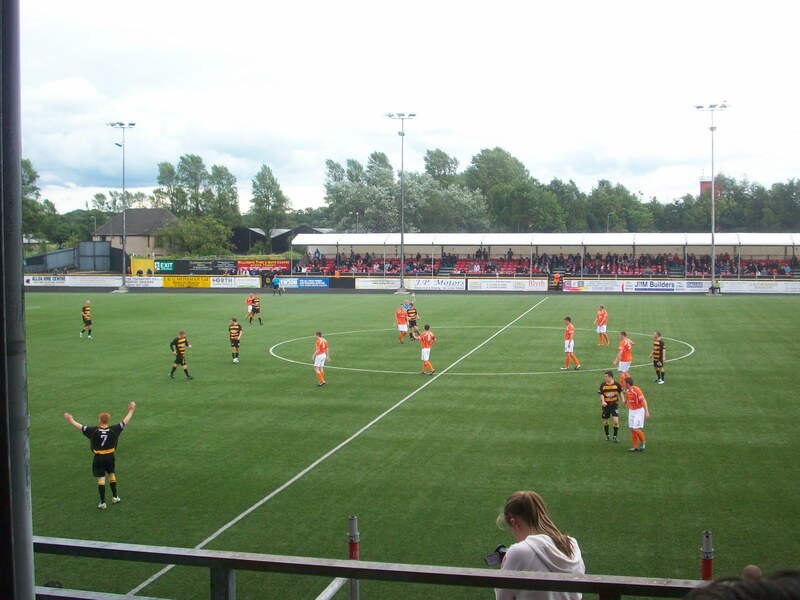 First stop this season in my quest to discover the best support experience at a Scottish League club was at the home of Alloa Athletic FC, the famous Recreation Park. This was also my first test of the new scoring categories which will determine who wins the award and gets my hard-earned sterling and loyalty for a year in 2012/13. 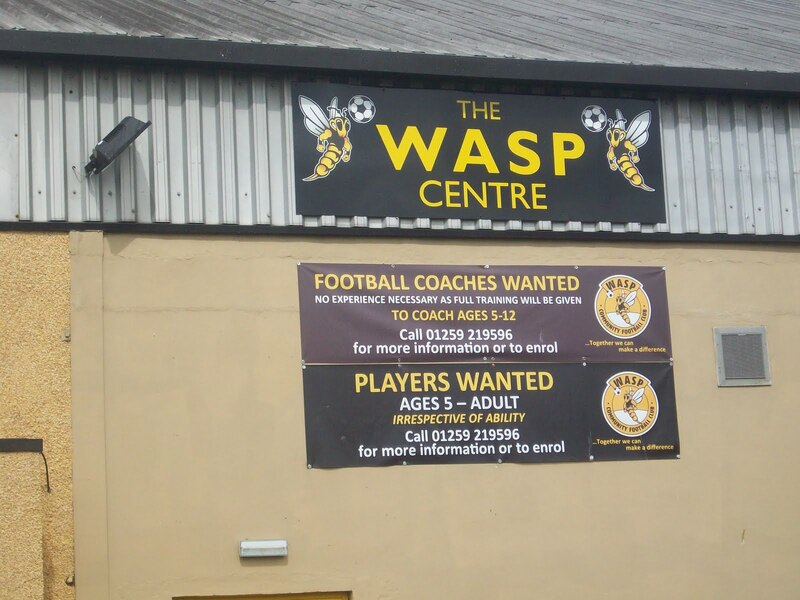 Turns out the Wasp Centre is a Community Centre heavily supported by the football club, whose purpose is to maximise the opportunities for both genders and all age groups and abilities, to play, coach, and support football. An extremely noble cause I’m sure you will agree – and a positive first impressive of the football club as a part of the community. 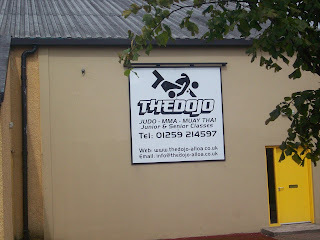 Beside it was the Alloa Dojo which does not quite adopt the same “anyone can turn up” spirit – I’m guessing you might need to be a bit nuggets and have a touch of the mentalist about you to get involved….although don’t tell them I said that! As always on your way to a footie ground, you look out for something distinct to let you know that you are there – usually floodlights in the distance. In Alloa, they make it pretty obvious that you have arrived at your destination. Behold…….the WALL OF ALLOA! Entering the turnstiles beside the main stand, I had a look around and got my bearings. 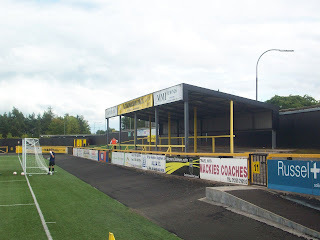 Opposite was a modern looking stand, where the away fans were clearly situated. 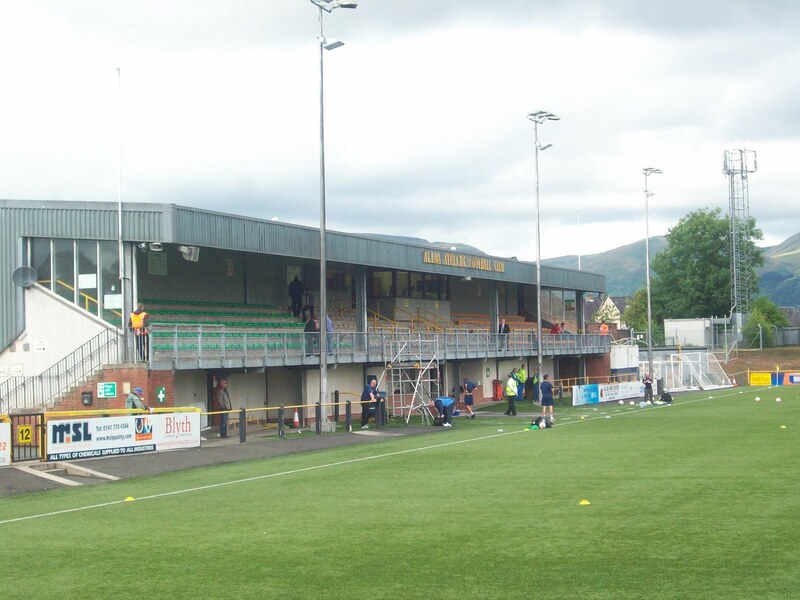 To my left, was the Main Stand (picture 1 below) and to my right, the Clackmannan Road End (picture 2 below) which is a truly bizarre little piece of kit, but brilliantly quirky. I also immediately noticed that Recreation Park is one of these grounds in which, if you so desired, you could walk all the way round. For those who like to stand behind the goal their club is attacking….this is a massive bonus. 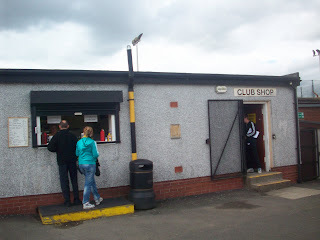 However, for consistency’s sake I decided to sit in the Main Stand – but not before I checked out the scrannage on offer. At Recreation Park, the catering stall and club shop are all in the one building (divided by a wall, or that’d just get messy) with the latter selling programmes, kits and scarves etc.....and chocolate, crisps and other confectionary from a vending machine! I wondered why there was a vending machine but then, as I approach the front of the food queue, I realised that Alloa had no regular set up…. As well as the massively friendly staff, what I liked about the catering here was the fact that there seemed to be no pre-printed menu, no consistency from week to week (fans…correct me if I’m wrong?) but instead a white board with match-day options written on in wipeable marker pen! I opted for the standard Pie and Hot Drink (tea) which came in at only £2.00 and was of a reasonable standard. I won’t lie…it wasn’t luxury stuff but quite passable. Pie in hand, I took my seat in the “Green Section” of the Main Stand. Now, when I say section I don’t want people to think we’re talking tens of rows and hundreds of seats in each row. The Green section, like that of the beige and yellow and the rest consists of 11 seats in each row and six rows in total. On my left was the above pictured beige section which, I’m guessing, has housed the same set of old men for the last 50 years. As each flat capped old boy arrived, he was greeted with a handshake and some friendly banter from his peers. 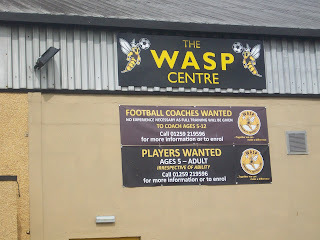 A nice sight at a football ground in 2011. That said, even in my comparatively youthful Green section, fans were extremely good natured, friendly, knowledgeable of the game and extremely sporting – appreciating both Alloa’s positive and negative traits and always quick to praise the opposition where deserved. The atmosphere, in terms of decibels, wasn’t particularly raucous. Passionate though, but in a quite controlled sort of way. Refreshing actually. The home fans could actually have been forgiven for being overly excited watching their team. 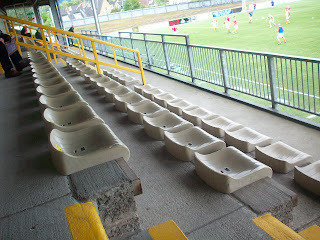 For me, Alloa were massively entertaining. Paul Hartley (of multiple club but mainly Hearts & Celtic fame) has them playing some superb stuff – they press high, play quick and short passing football and like to build from the back. 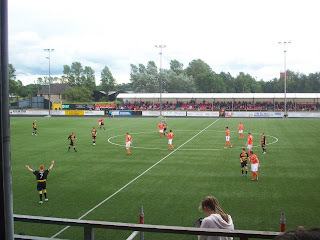 At any level, this is a joy to behold and although the game finished 2-2, it was more down to being unlucky and a bit wasteful that Alloa didn’t take all three points. Oh…and a ridiculous 35 yard strike from Clyde’s John Sweeney. Some Alloa players also stood out and are worth a mention. At right full-back is a greyhound of a man by the name of James Doyle. I dare to think how much ground he covered over the 90 minutes but he deservedly won man of the match. Skilful, powerful and with excellent distribution, I think the boy is a talent. At centre half, the traditional big bruiser of a number 5 in the form of Ryan Harding. The fella is truly “no nonsense” in a lot of ways…happy to go through people and batter in. Equally though, he likes to play football and is comfortable taking the ball from the keeper and playing it out. Solid player. In midfield, alongside the superb Graeme Holmes, are the Brothers McCord – Ryan and Ross. 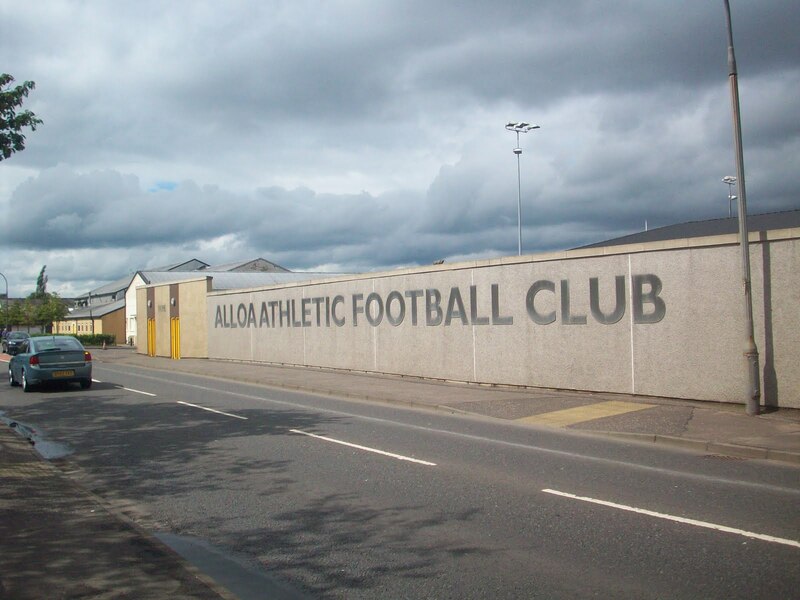 The former really did contribute to a hell of a lot of the good things Alloa did in this match. Box to box, two footed and with an eye for goal….he’s a very good player. His brother Ross…slightly different player…very effective right sided midfielder and equally happy using both feet. Good pairing. Finally, a mention for the lads up front – Max Wright and Kevin Cawley - who I honestly thought were going to die from exhaustion from the amount of work they put in. Both are quite small, pacey types but with great skill and work rate – caused Clyde’s defence all sorts of problems. Oh and I will put one final mention in to a gent who was an unused sub on the day but, who I believe is a bit of a goal machine – Craig Campbell. Keep your eyes peeled for him this season. Thoroughly nice bloke too – gave me some Twitter banter before the match! For the £12 entry fee, this proved to be very good value for money. Factoring in all the above and adding on the choice of music inside the ground – similar to that a DJ would play at a 50 year old woman’s birthday bash (Tina Turner, Diana Ross, Bee Gees, Abba etc) and the fact that the toilets were well stocked with paper towels ensuring that my dropping my wallet in the urinals midstream wasn’t too traumatic…I’d say Alloa is a strong contender for Best Supporter Experience!